Six days ago, astronaut Mark Watney became one of the first people to walk on Mars. Now, he’s sure he’ll be the first person to die there. After a dust storm nearly kills him & forces his crew to evacuate while thinking him dead, Mark finds himself stranded & completely alone with no way to even signal Earth that he’s alive—& even if he could get word out, his supplies would be gone long before a rescue could arrive. Chances are, though, he won’t have time to starve to death. The damaged machinery, unforgiving environment or plain-old “human error” are much more likely to kill him first. But Mark isn’t ready to give up yet. Drawing on his ingenuity, his engineering skills—& a relentless, dogged refusal to quit—he steadfastly confronts one seemingly insurmountable obstacle after the next. Will his resourcefulness be enough to overcome the impossible odds against him? 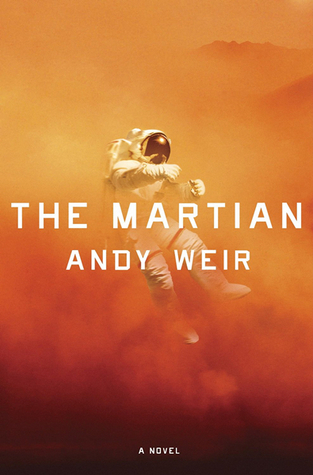 Mark Watney is an amazing character. He’s the definition of what you hope every character will be and you fall in love with characters like him. He was resourceful and smart and never lost his sense of humor throughout his whole ordeal on Mars. He made mistakes and he learned from them, but he never hated himself for making them. He was my absolutely favorite part of this book. He’s the first part of the story you get invested in. And then you feel like you’re trapped there with him and you’re figuring all these things out just as his is. (Except for the moments that you realize you’d be so screwed because you know nothing about how to do any of the things he’s doing). Bottom line, this book feels like it teaches you something. You laugh and you sit on the edge of your seat and you cannot wait to see how it all ends. And those are the best kinds of books – the ones that make you root for the character and want to see how it all comes together in the end. On a side note, I will be heading to the movies later today to see the movie rendition of this book. Heard great things about it, so fingers crossed!